Two passengers and a pilot were taking a waterfront tour, when the R44 experienced mechanical problems and an emergency landing was made. The helicopter struck two vans near a golf course and caught fire, but all three occupants got out before the flames broke out. Helicopter sank into the ground on landing and then tilted backwards. The pilot applies more power but loses control of the helicopter which falls onto its side. on a local pleasure flight from a private facility at Redfern Lake, BC. As the pilot attempted a landing at approximately 7800 feet ASL near the edge of a cirque, the aircraft encountered descending air on final. The pilot elected to continue the approach and increased the collective to maintain the sight picture. The pilot then noticed the low rotor warning with the rotor RPM decreasing rapidly toward 70%. The aircraft landed hard and rolled over several times down the slope. The pilot and the two passengers evacuated the aircraft with no injuries. There was no post impact fire; however the aircraft sustained substantial damage. During takeoff, the helicopter rolled over. The pilot, the only person on board, received minor injuries and the helicopter was substantially damaged. During a hard landing in a field with low-level crop (presumably an emergency landing? ), the helicopter rocked back onto its tail, resulting in the tail rotor gearbox and tail shearing off. Rest of helicopter appears unscathed, apart from the skids being splayed out as a result of the heavy landing. The helicopter landed hard from an altitude of about 15 feet and slid about 8 to 10 feet. Both skids were spread apart and broken and the helicopter came to rest on its fuselage. Both tail rotor blades separated and the vertical stabilizer was damaged. There was some buckling of the fuselage. The tail boom and main rotor blades appeared to be undamaged, and there was no discernible tail strike. Clipped tree and crashed to the ground during filming operations. Wayne Bomstad received minor injuries. Pilot Jacob Oliver was still in hospital four days later according to this report. Large taildragger fixed wing (Boeing Stearman N56200) taxied directly into the parked and unattended R44, causing extensive damage to cabin, avionics etc. Date is estimated, and may be any time in the range 23-Jun (last known flight) to 05-Aug, when the helicopter was seen damaged on a trailer in the insurance compound at Fairoaks Airport in the UK. Helicopter looks mostly complete, but tail boom a little bent and the lower part of the tail is bent round, suggesting a tail strike. Helicopter was being used to spray fungicide on fields of corn. The pilot approached and overflew one field checking for hazards and wind conditions, and then began a spray swath across the field. Midway through the first swath, the pilot heard the low rotor horn sound. Manually rolling the throttle up did not prevent the rotor RPM from continuing to drop. The pilot then attempted a quick stop and a controlled autorotation into the corn. The helicopter was substantially damaged by the impact but the pilot who was wearing a four point shoulder harness and a helmet was not injured. 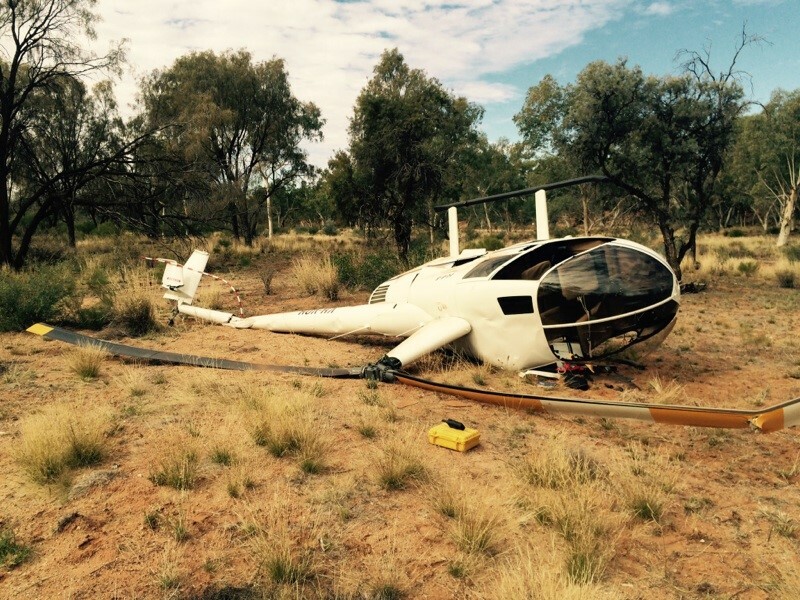 During mustering operations, the helicopter collided with terrain, resulting in substantial damage (photo). The pilot, who was the sole occupant of the helicopter, sustained minor injuries. The pilot was intending to make a local flight and having completed his pre-flight checks, gradually increased the rotor rpm to about 80%. From the CCTV it can be observed that at about this time, the helicopter rapidly yawed to the left and rotated through about 290° before tipping over onto its right side. The helicopter came to rest with a sufficient gap between the forward right door, which had opened as the helicopter struck the ground, and the concrete apron to enable the pilot to vacate the helicopter unaided. The pilot reported sustaining minor injuries. Very heavy autorotation landing resulted in skids being ripped off and helicopter coming to rest on its starboard side. Owner reported in his own Facebook post that this was after the “newly fitted Lycoming Engine had just 15 minutes of flight time and lost power on its second flight approx 10 minutes after take off”, and happened at a reported 400ft agl. A later report quotes the South African CAA as saying the issue “was solely caused by a Spider Fuel Distributor that came apart in flight after engineers had hand fitted four pipes and failed to use proper equipment to tighten the flexible pipes with metal endings”. Extensively damaged – hired by PPL from Hélitravaux. 3 POB all to hospital. Appears from BBC story that pilot had problem with tail rotor control and executed a run on landing on a level but soft field, and then one skid dug into the mud and flipped the helicopter over. Pilot experienced a loss of engine power during turn on approach – autorotation unsuccessful due to low altitude. The helicopter landed hard and rolled onto its right side, resulting in substantial damage to the forward fuselage and tailboom. After take-off, the helicopter lost lift and collided with terrain, resulting in substantial damage. The pilot was uninjured. After taking off and clearing some trees, the helicopter began to lose rotor RPM and the pilot elected to land nearby. During the landing, the helicopter sustained some damage, but the helicopter remained upright and the pilot and passengers were uninjured. Helicopter was being used for a police search for a missing 23-year old who died after trying to ride a tyre tube down the normally dry Todd River.